Last setting is the group name the sensor belongs to. Sensors are dynamically added when they first join the network. The Sensor type can be chosen to any possible, as long as its value can be stored i a float variable. Main unit does not care about the sensors at all, it doesn't do any computation with it values, and also it does not verify the content. 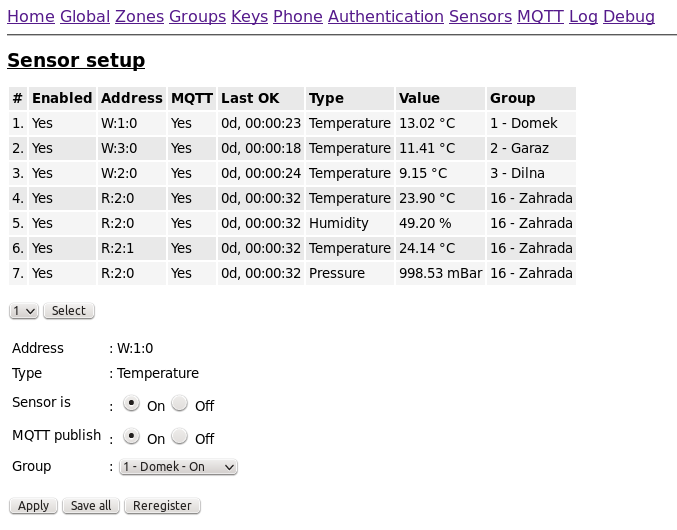 Main purpose is to act as a gateway for MQTT to NodeRed or similar tool. Only value that indicate the health of the sensor is time-stamp called last OK, that indicates delivery time of last message from sensor. In the future, the parameters for sensors, and also for authentication units, will extend as they will be battery monitored. I would like main board to take care of the sensors battery life in form of some flag and also sms.